When I first started Life Is Strange earlier this year, I was surprised by its effect on me. At the time, I had grown weary with the Telltale formula of modern adventure games based on a peculiar, if surprisingly effective, selection of licenses. Against Telltale, DONTNOD’s entry can be likened to an upstart indie film competing against its more mainstream contemporaries. Shying away from major properties like Back to the Future, Borderlands, and Minecraft, DONTNOD designed a story set in a mostly mundane representation of the Pacific Northwest. It may be a little rough around the edges, but it also turned out to be one of 2015’s most interesting surprises. From the very beginning, Maxine Caulfield struggled to understand her bizarre gift, to go back and change time. Though her life has been interrupted by visions of a cataclysmic tornado and a series of freak ecological happenstances, the meat of the narrative is her reunion with Chloe, a childhood friend. The relationship between the two women grows and strengthens in each episode and their quest to seek out Rachel Amber, the sweetheart of Arcadia Bay, only strengthens their bond. It is this friendship that allows Max to justify the liberal use of her time travel ability. Through their adventures, investigations, and private moments, Max is driven by the desire to make everything “right.” Like Sam Beckett before her, Max takes some pretty deep dives to help Chloe and the students closest to her. These actions come at a cost, as a butterfly effect keeps Max confused and torn between the choices she is forced to make. The tension, drama and angst intensifies in “Polarized,” as Max is forced into increasingly difficult dilemmas. 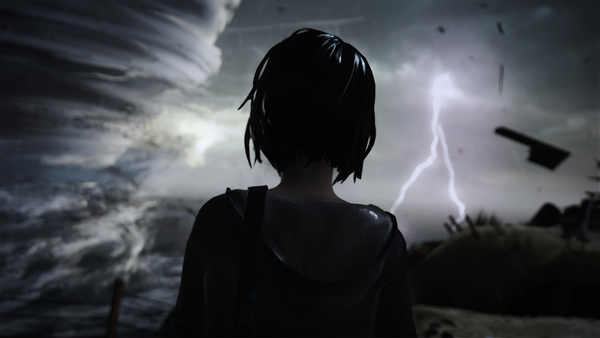 And like any episodic game worth its salt, the effects of the player’s actions through the series jump across Max’s path as she balances the lives of her friends against a destructive force of nature. Working with a purpose, Max's character makes noticeable changes and she grows more aggressive and freewheeling with her power by returning to a skill seen in episode three that involves jumping to a photograph's point of origin. Her nearly reckless behavior builds to the game's most dazzling set piece: a temporal nightmare rich with strange quirks, oddities, and genuine creepiness. Where most of Life Is Strange is a slow burning character drama, “Polarized” keeps the player engaged with confrontations and circumstances that require creative fourth dimensional thinking. DONTNOD does a great job of maintaining momentum throughout the episode, spreading out action and urgency up to its final climax. Life Is Strange hits all the right notes for a sleeper hit. Max, Chloe, the students at Blackwell and residents of Arcadia Bay are fascinating by themselves but made all the more real and endearing by the men and women who voice them. The hand painted aesthetic of the game’s graphics adds to the story’s sleepy, dream state. The soundtrack is fantastic and, though I’m probably repeating myself, whoever was in charge of selecting the tracks has a talent for directing and planning the musical accompaniment to the game’s most dramatic moments. Texture pop-in is frequent during the episode’s nightmare sequence, as it has a visibly hard time catching up with the frequent scene transitions. However, I forgive the game's technical limitations based solely on how well it exceeds at everything else. Life Is Strange uses the Telltale blueprint to tell a good story supported by great sense of style towards setting, visuals, and maturity. It's a meaningful and beautiful creation far more entrenched in the human experience than any other game I've played.